The www.poseidontravel-tinos.com online store accepts Visa, MasterCard, Maestro, American Express, the electronic wallet ‘Masterpass,’ Diners credit cards, debit cards and prepaid cards. For purchases made through a credit card, the customer should follow the instructions he will find in this online store. 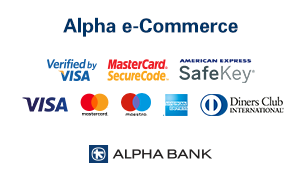 The credit card details are entered on a separate page, inside the secure environment (https) of our card processor, Alpha Bank. The credit card is charged if the data and its validity are checked and verified. The customer is solely responsible for the correct recording and the truth of the credit card details.